Hoplite Phalanx Blade, Tempered What's this? The Greek hoplites were, pound-for-pound, some of the best armed and armored soldiers in history. This phalanx sword was an integral part of their combat equipment. Similar in style and construction to the Roman Gladius, the hoplite sword was relatively short, powerful and capable of both slashing and thrusting. 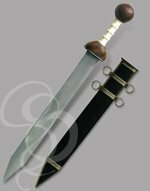 This is a spectacular reproduction of a hoplite sword. The blade has the characteristic oak-leaf blade, slightly wider toward the point than at the forte portion of the blade (near the pommel). The blade itself is a lustrous and powerful high carbon steel. The focal point of this sword, though, is the thick silvered guard. Simple and efficient, the cross nevertheless has a pleasing aesthetic to it; a lion's savage beauty. The pommel is also silvered to a mirror finish. 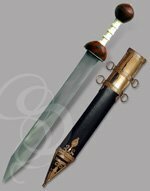 The second focal point of this sword is the brass studded scabbard; easy to grip and easier to find on your belt when your spear has snapped in half. The scabbard also looks darn cool, making this a sword that looks great both in and out of its sheath. 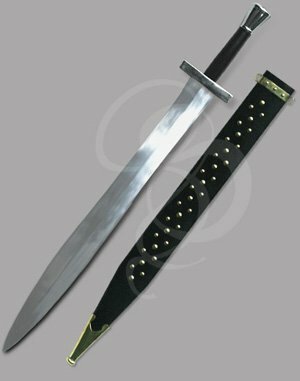 Perfectly acceptable for light sparring (under the proper supervision), but not recommended for serious blade to blade action. This is a truly wearable sword and a resplendent addition to any collection. I just wanted to send a big thank you for ensuring that my wedding gift to my husband arrived in time for our wedding. it was used in the ceremony & is in alot of our photos. I was very impressed how fast you shipped the Hoplite Phalanx Blade and will be buying from you in the future. It was also a nice gesture sending a special gift with the package, it proves that there are still decent people out there. Thank you so much again......my husband is a very happy man.